The Renault and Dacia stands are going up just fine, and everything will be shipshape by the big day. In how many hours’ time? Nothing is left to chance: vacuum cleaners are humming, and people are busy cleaning, polishing, adjusting, whatever. They’re taking every possible measure to ensure the most attractive setting possible for our superbly appealing cars. 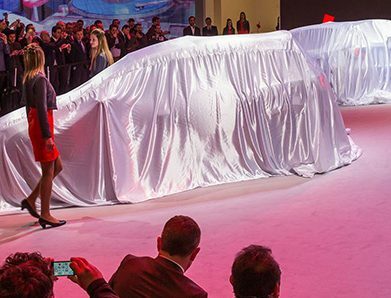 Be ready for the RENAULT and DACIA Press Conferences Live on our website tomorrow. Live online coverage of press conference by Carlos Ghosn, Groupe Renault CEO, and Laurens van den Acker, design chief. 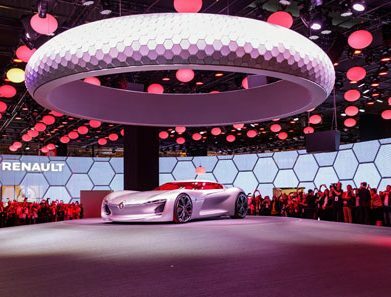 Exclusive coverage of what’s new from Renault, including a new electric GT concept car. Not to be missed under any pretext! 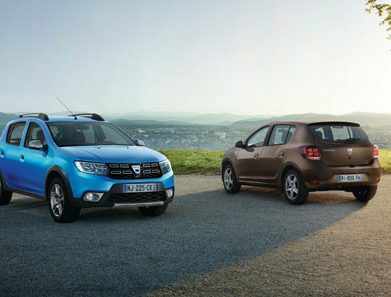 Dacia press conference live online, with exclusive coverage of what’s new from Dacia. Prepare your visit to the show: check out our Data Room for details on what’s new at the motor show. with Nicolas Carpentier, star of the Renault advertising campaigns. Come and test-drive ZOE and Kangoo ZE: Hall 3. 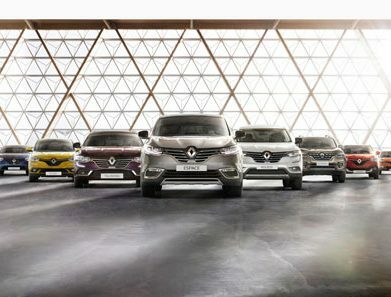 Book your test-drive with the Renault hostesses. Don’t miss the visit by Michèle Laroque! New interior and exterior design for Dacia Logan and Sandero models. Take the time to examine them in detail. 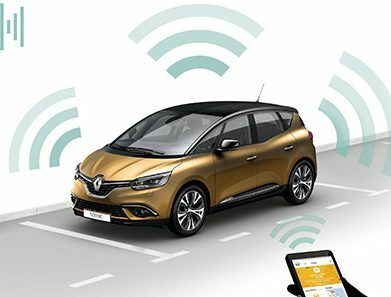 Renault’s new concept car foreshadows some of the technologies that will be appearing on the Renaults on the road tomorrow. A unique opportunity to meet up with Renault engineers and other experts, and get their input on Renault innovations and technologies such as Four Control, Multisense, electric vehicle power, and vehicle connectivity and multimedia. The whole of the Stade Français team will be there at the Renault stand. Groupe Renault is hiring. 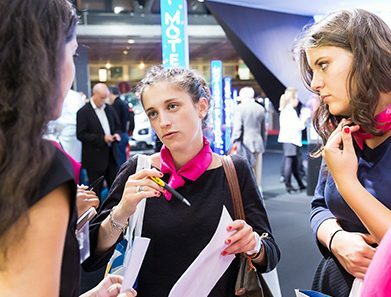 Recruitment managers will be at the Renault stand to provide applicants with personalized career guidance advice, inside information on automotive industry careers, and full details on vacancies at Renault. Radio FG will be spinning the turntables for a special programme live from the Renault stand. 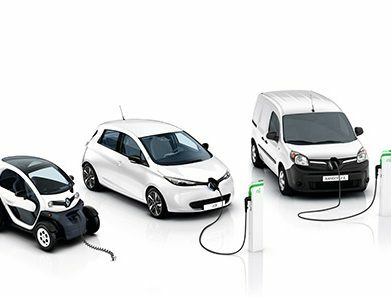 Electric vehicle experts will be at the Renault stand to tell visitors everything they need to know about the electric vehicle and how it works: batteries, travel range, wiring in a home charging station, etc. F1, FE, Twingo GT, Mégane GT, Clio RS Trophy, etc. The Renault sports models are all there: from the racetrack to the road. 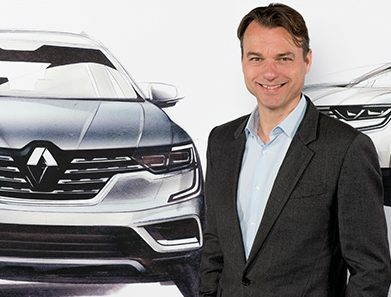 Renault design chief Laurens van den Acker presents the new concept car. 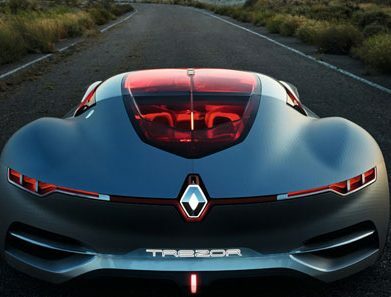 Stéphane Janin, Renault concept car design director, presents the new concept car. 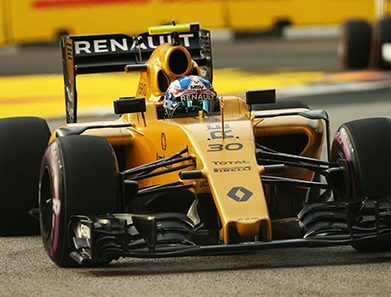 Renault and motor sport: intensive involvement dating back 115 years! Come and share our motor sport enthusiasm, and meet some of our racing drivers: Jolyon Palmer for Formula 1 (late morning), Nicolas Prost for Formula electric (early afternoon) and Jean Ragnotti (afternoon). Watch out: the show’s winding down this very weekend! Last day of the show, New Clio, New Scénic long version, and Logan and Sandero revamps. Come and see for yourself. Like now!